This is the balloon starter kit that is required to get you balloon modelling. You will be able to make all 10 of the models shown on the DVD, Back to Basic's Vol 4 with two bags of 260 modelling balloons supplied and a large two way balloon pump for ease of inflation. Normal price when sold seperately £31.99. The starter kit has over 20% off the list price if items were bought seperately. 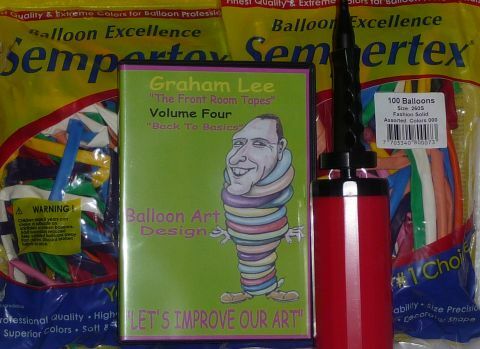 The kit includes, Graham Lee DVD Volume Four, two Bags 260 mixed balloons and a large two way balloon pump. Models explained on the DVD are, Sword, Swan, Sausage Dog, Giraffe, Teddy Bear, Frog, Monkey, Lady Bug, Snake and Dinosaur with the instructions explained face on and over the shoulder for easier explanations on the DVD. SKU: starter kit "A". Category: Balloon Starter Kits. Tags: balloon modelling starter kit, balloon starter kit, sempertex balloon starter kit. This is the balloon starter kit that is required to get you balloon modelling. You will be able to make all 10 of the models shown on the DVD, Back to Basic’s Vol 4 with two bags of 260 modelling balloons supplied and a large two way balloon pump for ease of inflation. Normal price when sold seperately £31.99. The starter kit has over 20% off the list price if items were bought seperately. 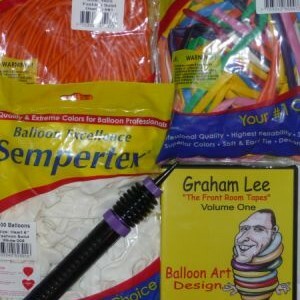 The kit includes, Graham Lee DVD Volume Four, two Bags 260 mixed balloons and a large two way balloon pump. Models explained on the DVD are, Sword, Swan, Sausage Dog, Giraffe, Teddy Bear, Frog, Monkey, Lady Bug, Snake and Dinosaur with the instructions explained face on and over the shoulder for easier explanations on the DVD. Share the post "Balloon Starter Kit “A”"